From the brand that brought you the Arnold-line of supplement comes a thermogenic blend that promises to speed up your metabolism to achieve your targeted body fat goals. MP Shred Matrix is one of the most well-known fat burning supplements around. Thanks to its reputable manufacturer, MusclePharm, Shred Matrix is now one of the most sought-after fat burners in the market. Thermogenesis is a simple process that involves speeding up your metabolism by increasing the core heat of your body. In theory, by turning up your core heat, your body uses up the stored calories in your fatty tissue to use as fuel for your body. Shred Matrix enables users to effectively use the process to convert stored fat into energy to fuel their workouts – but is it the best fat burning supplement around? Let’s find out. Shred Matrix contains more than 150mg of caffeine, which is about the caffeine content of two cups of brewed coffee. Avoid taking any other caffeinated product such as tea, coffee, soda, and energy drinks when taking caffeine. Higher levels of caffeine have shown to be hazardous to one’s health, especially with people who are sensitive to caffeine, and those who have cardiovascular disorders. 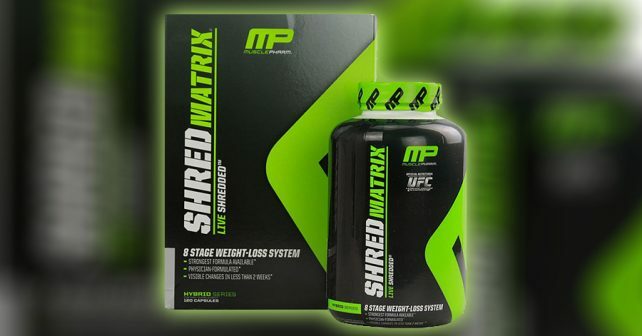 MusclePharm has a solid following for its other products, and it’s likely that they would pick up on Shred Matrix as their fat burning complex to complete their supplement stack. Shred Matrix is a cycle supplement for people who are done bulking up, and now cutting down to create a chiselled, muscular physique. All of these stages correspond to a group of ingredients that create a synergistic effect that creates a clean, efficient fat burning effect for the body. In a nutshell, the formula speeds up your metabolism to trigger lipolysis. Shred Matrix also helps reduce your hunger pangs, and it also deals with the psychological effects of reduced food and sugar intake through the use of nootropics. At its end stages, diuretics help flush out toxins, and lastly – it helps curb your cravings for sugar with ingredients that would suppress your natural need for sugary food. Shred Matrix is one of the most comprehensive fat burning pills available today. However, it deals with the major factors that could be controlled by willpower alone. If you are the type of person who has a firm grip on their diet, then all the other stages would mean nothing to you – and all it really does is to speed up your metabolism, which could be done more efficiently with supplements that are specifically made for thermogenesis.